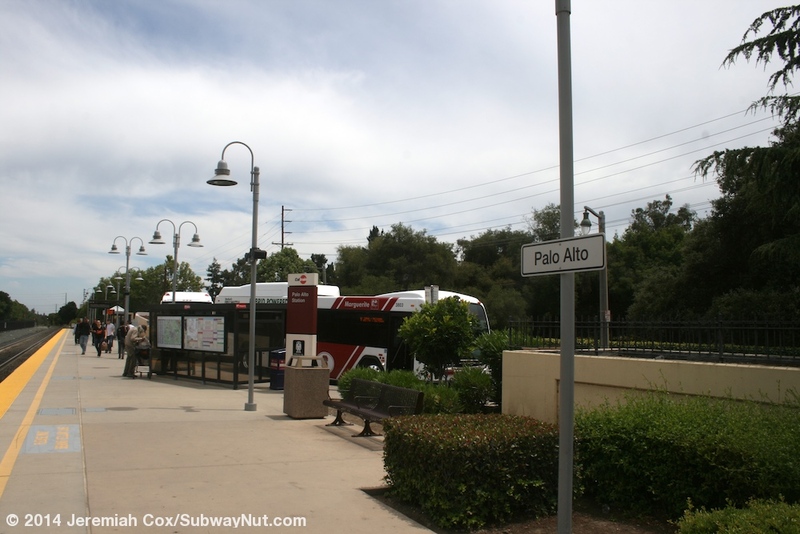 The Palo Alto Transit Center is one of the most important intermediate Caltrain Stations. 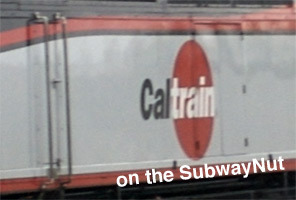 It has an extremely frequent Caltrain schedule with virtually every single Catrain trip, including all Baby Bullet Express trains, stopping at the station. Just 3 rush hour Limited trains in the San Francisco-bound peak direction bypass the station. 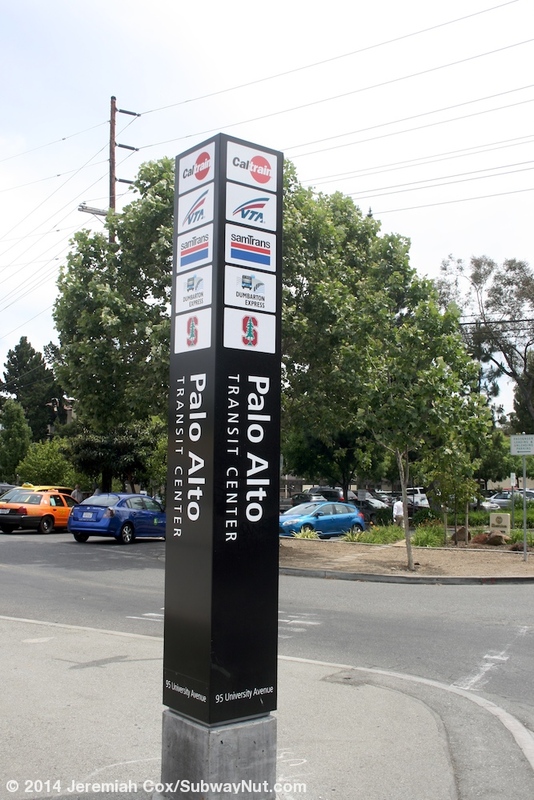 For buses the station is also a major hub and at a few entrances are concrete VTA entrance signs for the Palo Alto station. 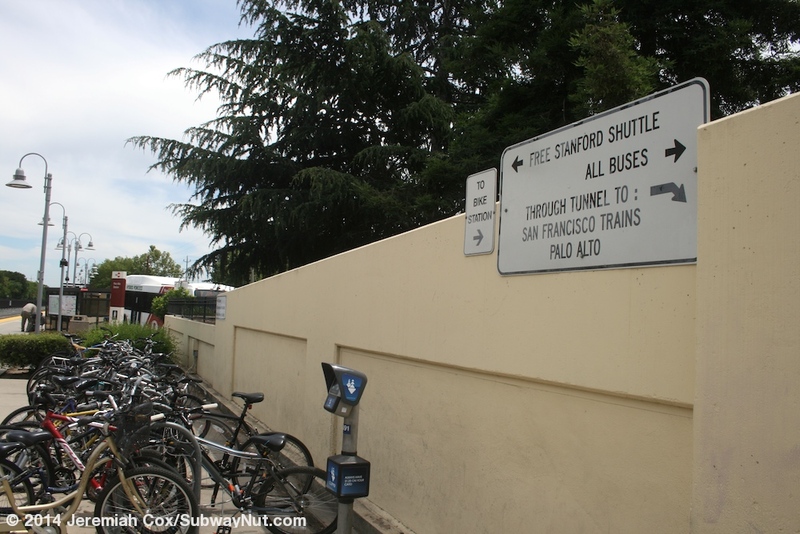 What makes these signs interesting is although the station is in northern Santa Clara County more SamTrans buses (7) from serve the station (granted the county line is less than a quarter-mile away) than VTA Buses. It is also the hub for Stanford University's free Marguerite Shuttle. 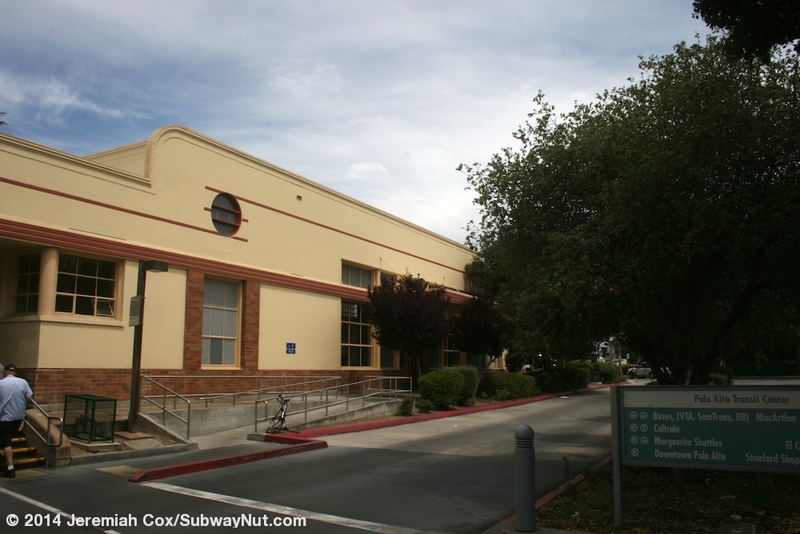 The current station is a historic streamliner moderne depot that was dedicated on January 26, 1941. 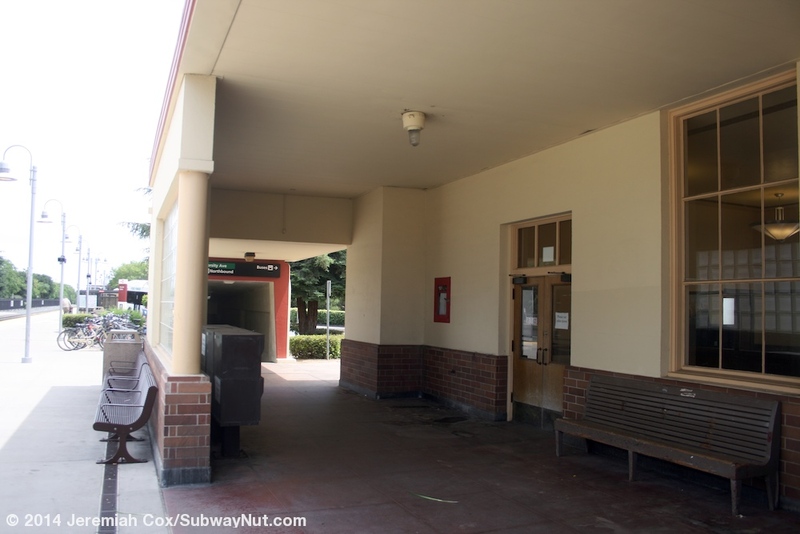 The station had a ticket office until it was closed on November 26, 2004 to begin a seismic retrofit of the historic depot and was never reopened since Caltrain decided to discontinue staffed ticket offices at all intermediate stations in the Summer of 2005. 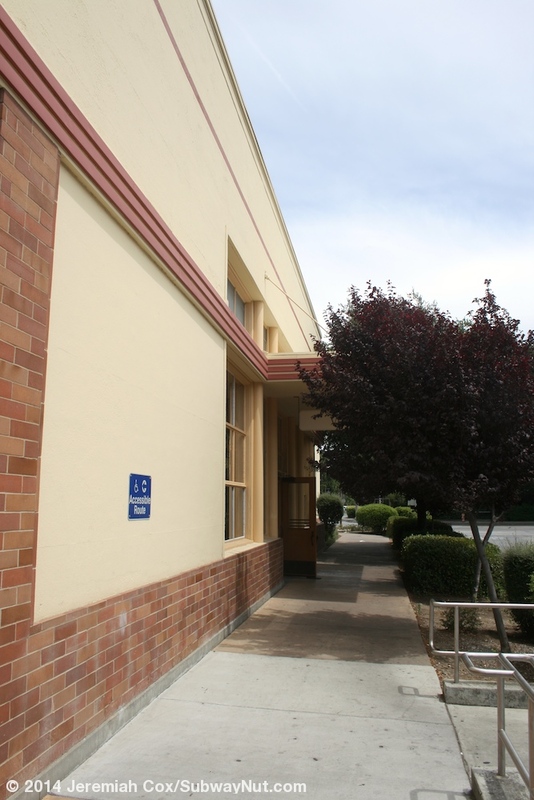 During the depots closure train certain riders were outranged that the only restroom (according to a 2006 article) was a European-style pay toilet placed outside the station. The most recent improvement project was dedicated in December 2008, costing $15 million and built new platforms and a new pedestrian underpass at the northern end of the station. 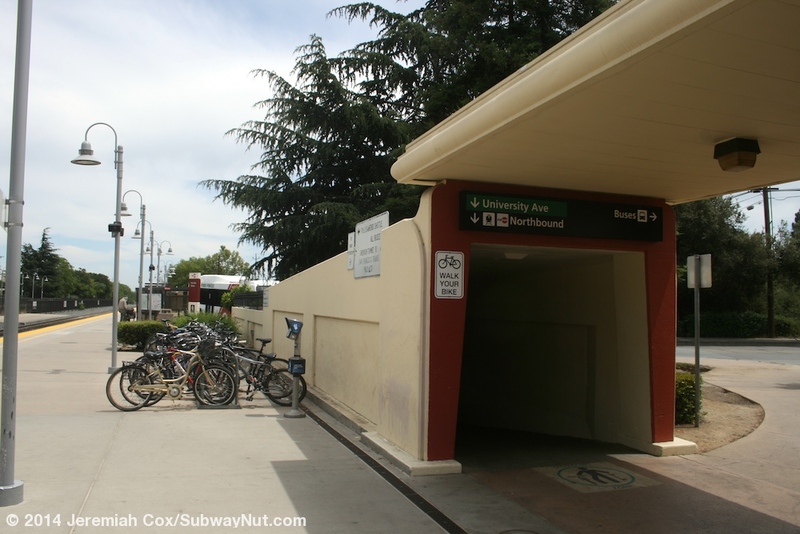 This renovation also gave the station black and modern BART style (with the exits having green backgrounds) signs directing passengers to exits and underpass tunnels. 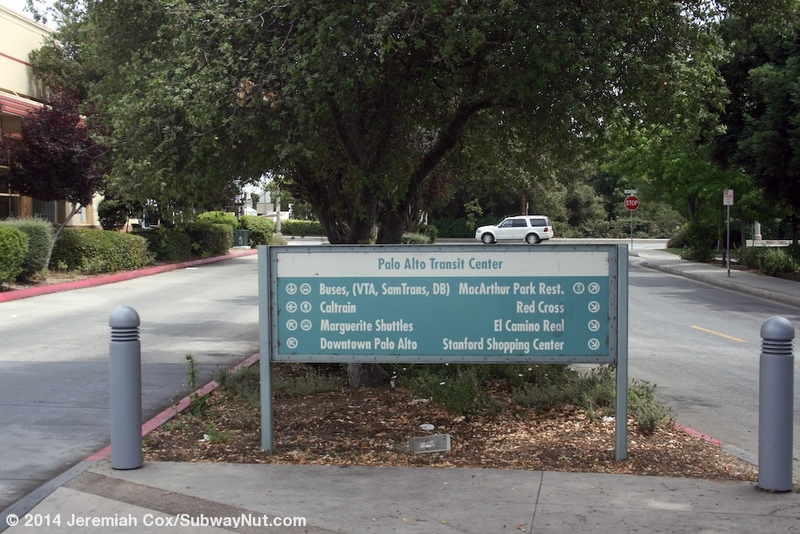 The station is located at ground-level but grade separated through downtown Palo Alto. The streets have tunnels under the tracks also tunnel beneath roadways that are directly parallel to and at the same level as the train line, particularly Alma Street, and the Embarcadero Bike Path. The station has two side platforms for the two-track line. Towards the southern end of the station platform is the underpass of wide University Avenue. This street's wide underpass crosses under Alma Street (that runs along the San Francisco-bound platform) with highway-style ramps down to each side of the street and a similar ramp loop along the San Jose-bound platform with Mitchell Lane going north and Urban Line heading south parallel to the rail line. For train passengers the sidewalks on each side of University Avenue, were the only (until 2008) and still are the main way to get between the two station platforms. Each side of the street has a gradual pedestrian ramp (with a concrete enclosure until it arrives at platform level) up to each platform. Another pedestrian only tunnel was built during the 2008 station modernization connecting the northern ends of each platform. 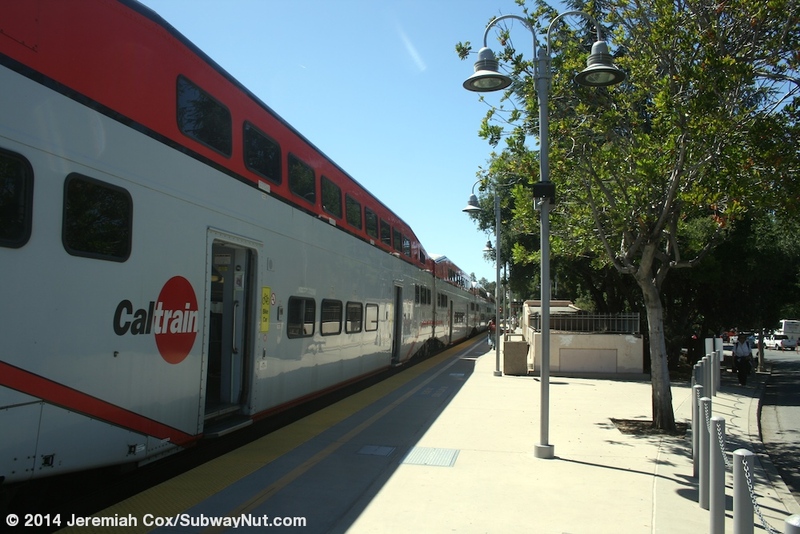 It has a more modern exposed ramp (the only one ADA compliant) and stairs down to each platform, the staircase on the San Jose side is within the confines of the northern side of the station's canopy. The one on the San Francisco-bound side has a bit of a concrete structure (beneath the level of the platform) where the staircase meets the ramp down to the platform. 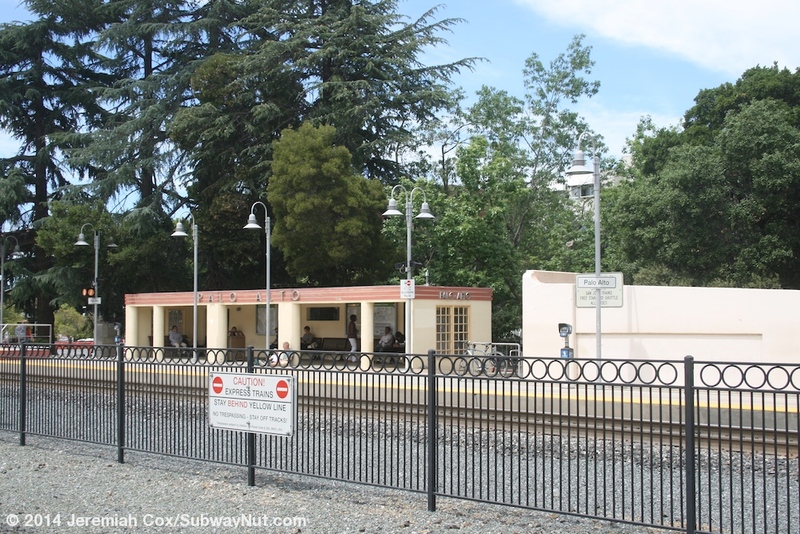 The San Jose-bound platform has the station's historic 1941 station house. This is a single story cream colored building with brick and other red accents giving it a streamlined look (just like the SP rail cars of the day). There is a unique mix of glass and frosted block windows that let plenty of light inside. 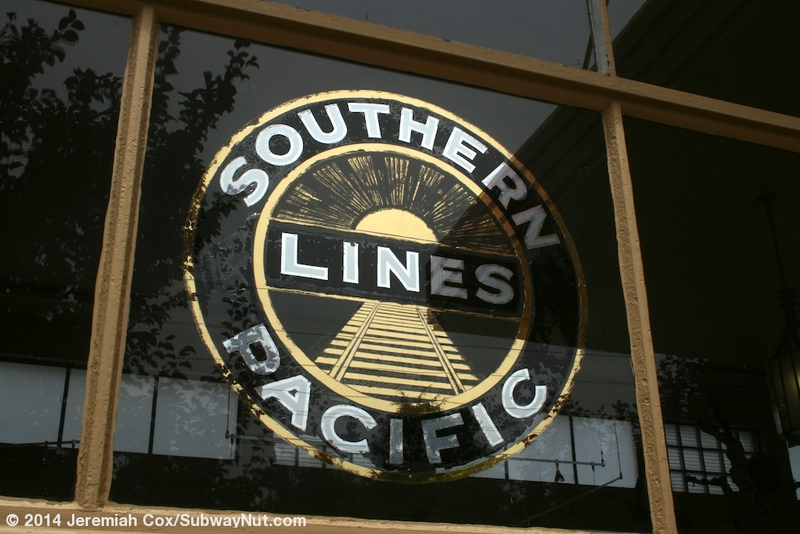 The Southern Pacific Logo is etched in some areas. 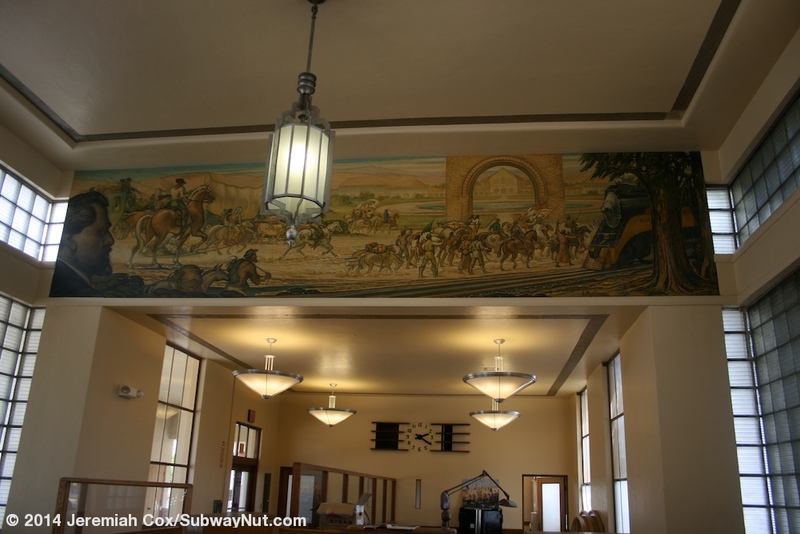 Above one wall is an original mural (from 1941) by artist John MacQuarrie. The painting tells the story of the history of transportation in California with a montage from the days of the Indians through the development of Stanford University and on to the streamlined era. Wooden doors lead into the station. 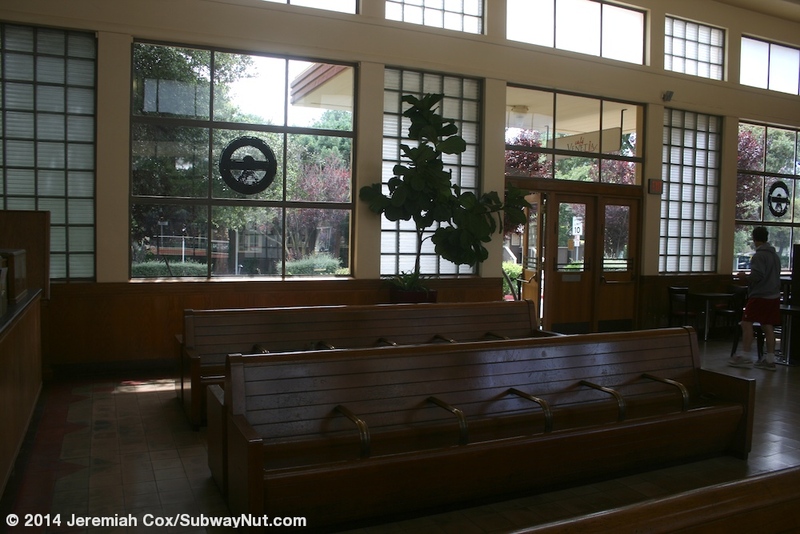 Inside is a still open waiting room with original wooden benches and Cafe Venetia, a coffee stand along one side of the room that is open all day, not just for the morning rush hour. 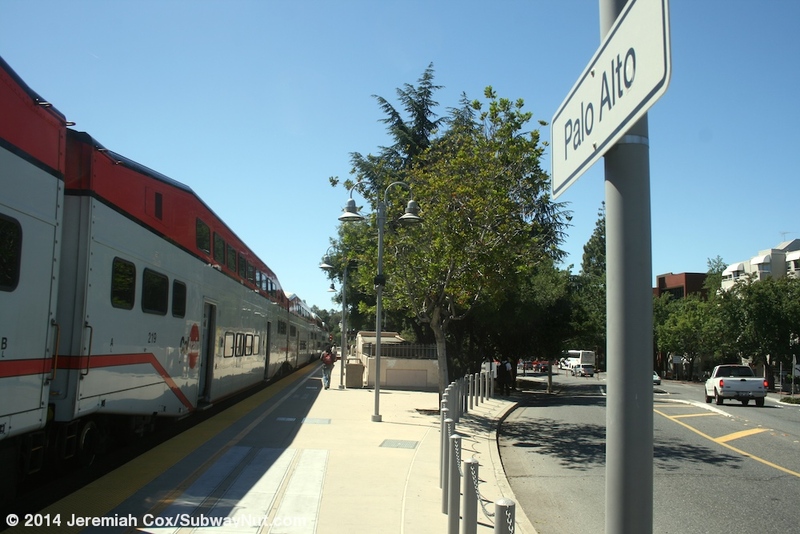 A large awning hanging from the depot covers benches on the platform with a streamlined red side and Palo Alto written in silver letters. Starting just north of the depot and continuing north of the station's platform is the station's large bus loop. This bus loop utilities reverse, left-hand running and looping to allow a single wide island in the middle of it to allow stops on both sides with ten bus bays (5 on each side of the island). Crosswalks lead to this island and bus passengers have 3 very large white, tent-like canopy structures that covers almost the entirety of the wide pedestrian island. 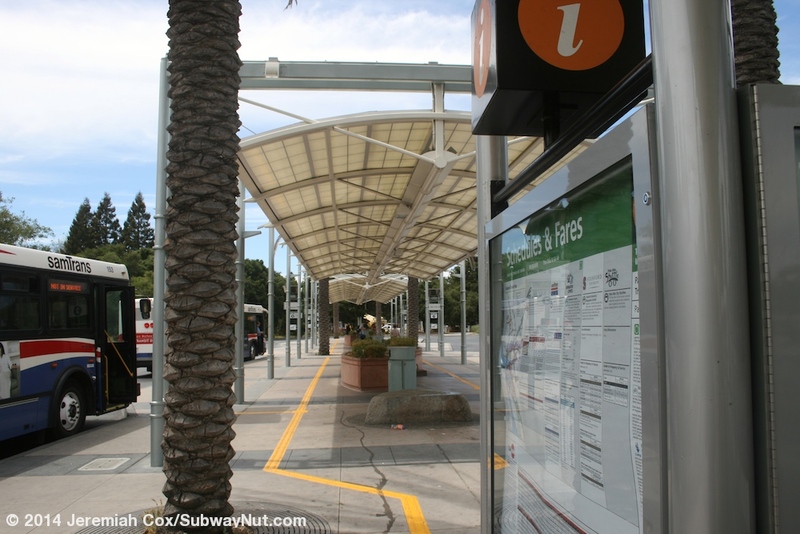 The main loop and bays are used by all bus routes except for some of the Marguerite Shuttle routes loop at the southern end of the station on the roadway above University Avenue. 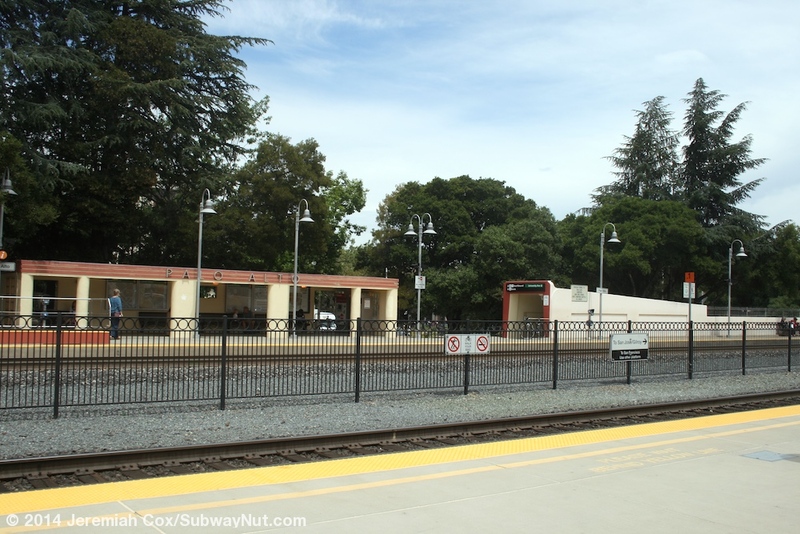 The San Francisco-bound platform is simpler with a historic, exposed to the elements, shelter in the same streamlined style as the depot. 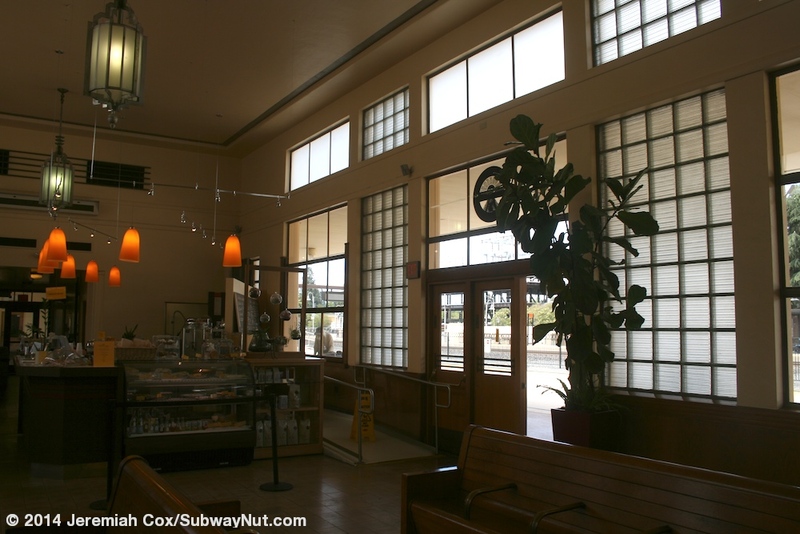 This wide shelter is a cream colored enclosed on three sides with glass windows at each end but open on the side to the platform. 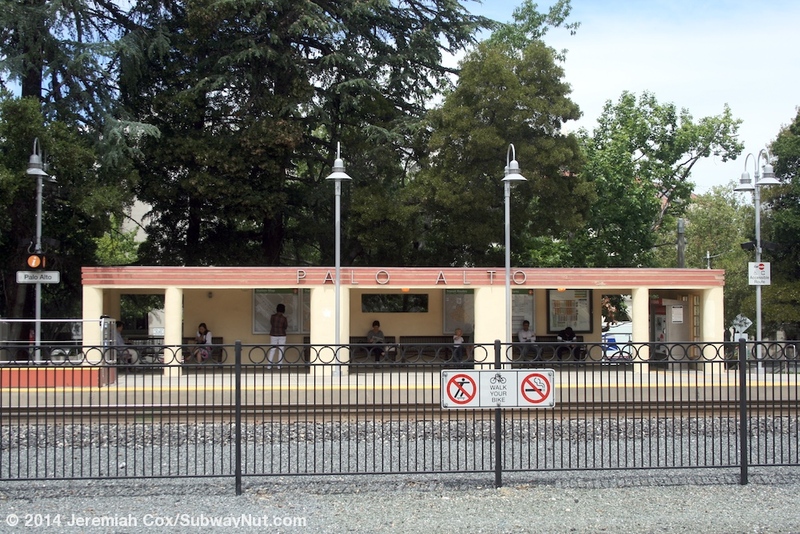 The roof only encloses the benches beneath it but the sides of the roof have three maroon lines (the streamliner branding) that have silver letters for Palo Alto similar to those on the depot. 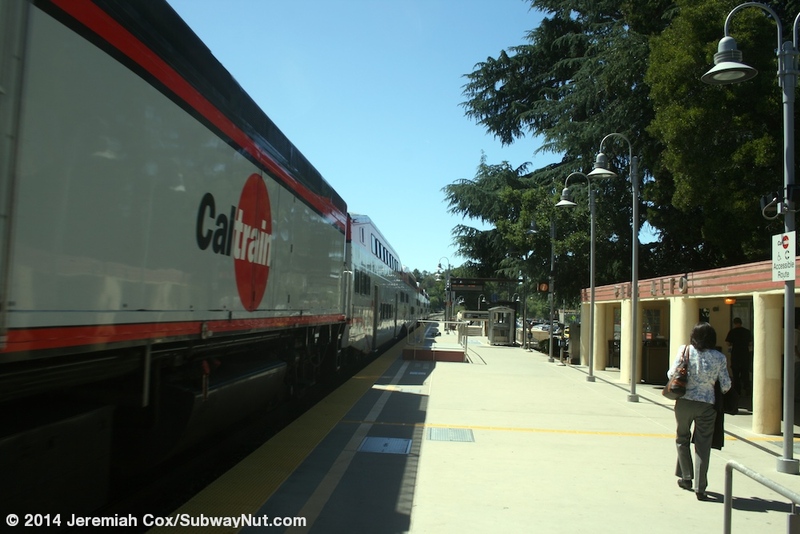 The San Francisco-bound platform is directly parallel to Alma Street and has most of the station's 398 parking spaces in narrow lots mainly north and south of the station in long and narrow lots between the tracks and Alma Street. 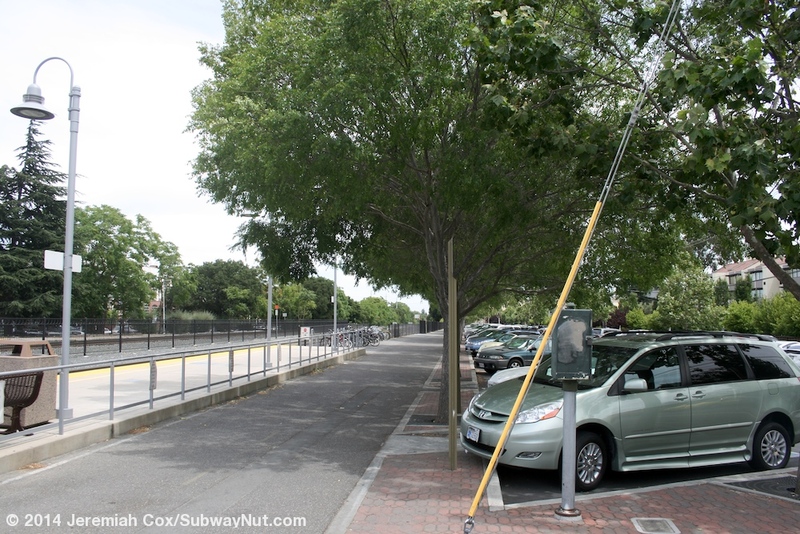 Urban Lane extending south from the San Jose-bound platform has additional parking.